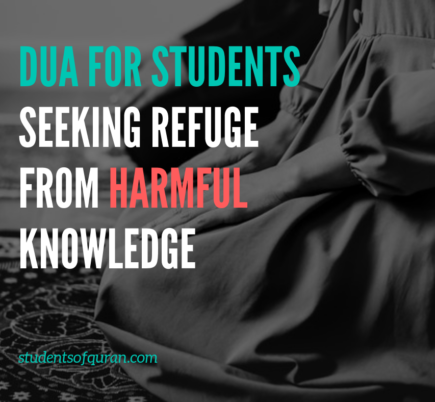 In previous duas for students we asked for beneficial knowledge, now we are doing the opposite, we are seeking refuge in Allah from a knowledge that is of no use. 4. From a dua that is not answered. If we don’t use the knowledge we acquire, then all the time and energy in acquiring it is wasted. Knowledge that is of no use can be harmful, for example, if someone tells you something about someone and you take it upon yourself to act on what you were told, you could be acting upon knowledge that is incorrect and of no use. It is always best to get both sides of the story before passing judgment. It is always best to approach something knowing the whole picture before you act. Approaching something from both angles is more complete, meaning when you understand both sides of something you get the whole picture. We want refuge from a heart that does not have kushu in it, no fear or humility. If you have knowledge of the deen, you have to act upon that knowledge so you should fear Allah and make sure you do what you are supposed to do. Your heart plays a very big role in seeking knowledge. If the knowledge does not have humility, then it becomes harmful. The worst arrogance is that of knowledge. What makes knowledge beautiful is humility, so don’t be arrogant and show off and think you are better because you believe you know more. A Scholar once said: three things happen as you gain knowledge. We want our soul to co-operate with us as it’s the nature of humans to always want more. That is why we train ourselves to be pleased and grateful for what we have. For example, fasting is good training for self-control and helps to kill the desire for greed. The homework we must complete as students is another form of good training. When having to complete homework, you have to pull yourself away from the things you like doing in this Dunya to complete it. It is a good training for you because its willpower to pull yourself away from the things you like doing. You may delay your salah because you are doing something that you love and you want to finish that first, in just one minute, one minute more, but time is ticking, by the time you look it has been an hour. We should seek refuge from such a heart that is not fearful, a heart that is not satisfied is greedy. 4. We seek refuge from a dua that is not answered. We want Allah to hear our Duas. Allah is the only one who can give us what we ask for. We will all have different challenges. We all have different circumstances, different relationships and for all these things we turn to Allah (SWT). You may feel disappointed when you really want something and you don’t feel you get an answer. In order for your Dua’s to be answered, you must be humble and express your need to Allah (SWT). When making Dua we may not see the answer we expected, since Allah may answer it in one of these three ways. We must be patient and never despair from making dua. Jazakallah to the SoQ team this is a brilliant post. A very needed dua for our generation and how wonderfully you guys have put it together. Excited to see more content inshallah! Masha-allah very good post.Jazakallah for sharing each and everything in detail. Beautiful reminder! This is indeed a powerful dua that we must preserve inshallah! This is one of the most beneficial posts I have read lately masha’Allah. I was on the search for a new dua to memorize and practice…you’ve made it so easy for me 🙂 Jazak’Allah khair! Mashallah, your welcome, you can find more duas in relation to seeking knowledge here. You can also download the pdf format by subscribing to the free resource library. Such delicate yet powerful reminders, something I needed to read and I’m so happy I was able to understand my readings too. SubhanAllah sis, this post was so beneficial <3 I think these points are so important to know! The most eye-opening for me was the "three things happen as you gain knowledge" part- I never thought of this, but this is so true! May Allah guide us and purify our hearts, and may we trust in His plans, ameen!